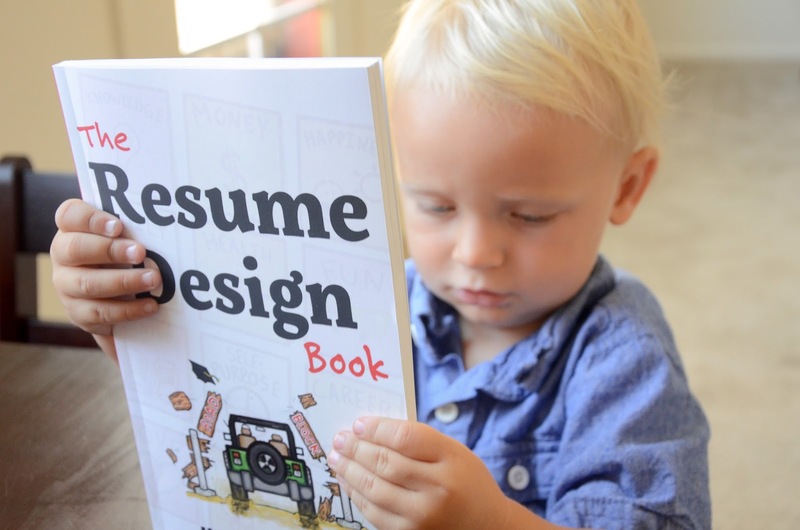 You're never too young to learn how to write a great resume! Whether you just graduated college, have been out of the work force for a while, or are looking for a new job, it all comes down to your resume, right? I’m a stay home mom going on 2+ years, as well as a small business owner going on 4+ years. Sometimes I come across job opportunities and wonder if I should apply. The thought of writing a resume and cover photo often change my mind about whether or not I want to apply. Putting into words exactly what I want to say doesn’t always happen. I regularly have the thought that if they just gave me the job they would see how awesome an employee I am. Unfortunately employers cannot close their eyes and simply imagine what I can do for them. When I read about The Resume Design Book by Matthew Cross, I decided it would be a good opportunity for me to create a new resume. 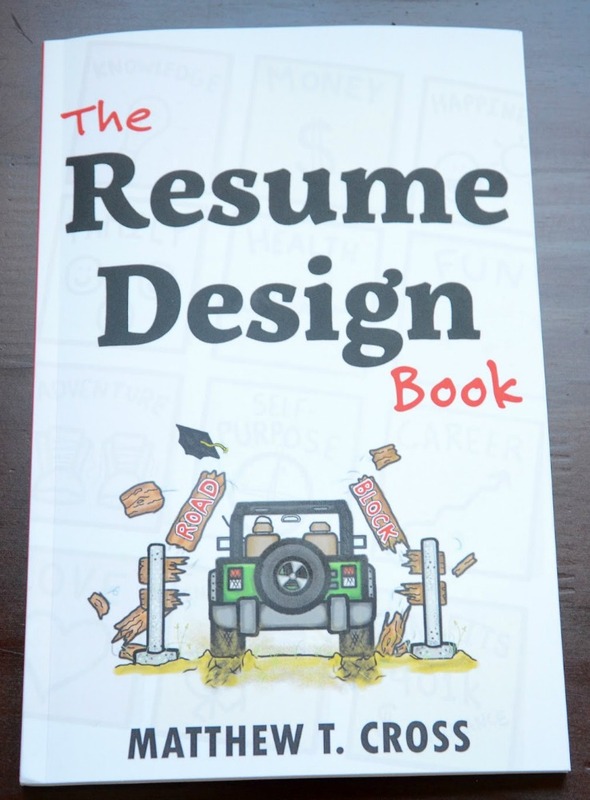 The Resume Design Book is a non-fiction graphically rich manual using design-thinking to write resumes, and is specifically targeted at those still in college. The book arrived on a Friday and I had read it cover to cover by Saturday afternoon. It is a short (126 pages) and easy read, with plenty of helpful information. Some of the information was not applicable to me because I was not a recent college graduate, but I was easily able to adjust it to work for my particular life circumstances. 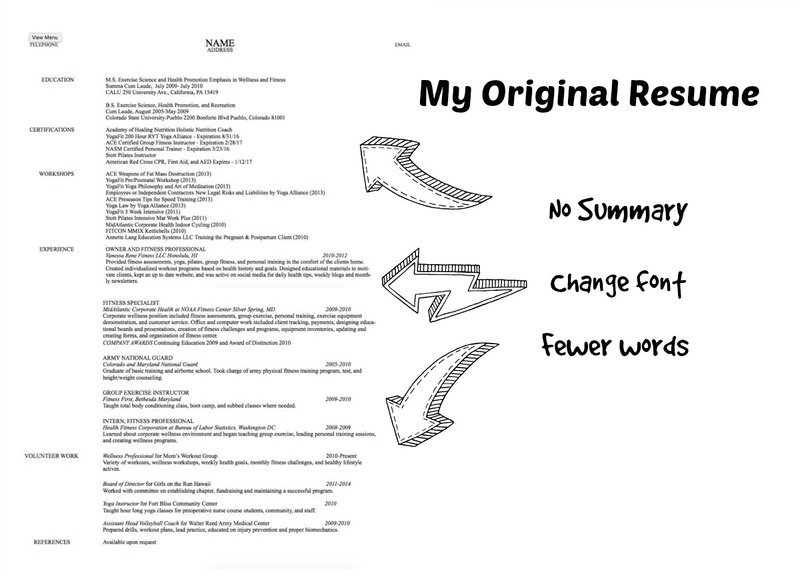 Once I finished reading The Resume Design Book, I pulled up my own resume. 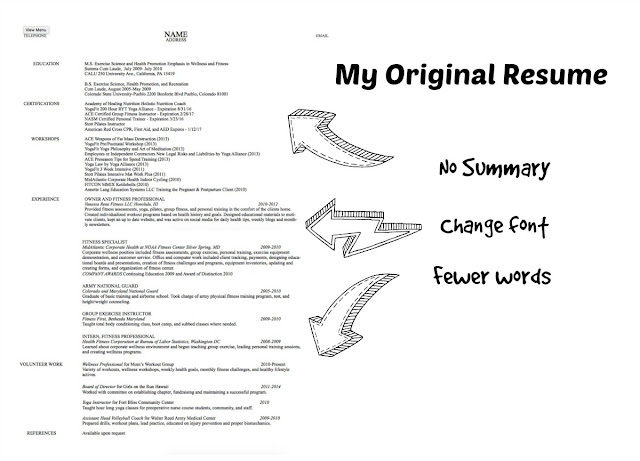 The first changes I noticed that needed to be made were the font, the word count, which was was too high and the creation of a summary to target the most critical information. I started cutting things out, re-arranging and deciding what really defined my skills. 1. Prioritize sections to what's important to your clients. I'd put Education after Certifications and Experience. 2. I love Army National Guard on there, but it doesn't quite fit with your other work experience. I'd rename "volunteer work" to "Leadership Experience" and place it within that grouping. 3. Try to condense the information in "owner & fitness pro" and "corporate wellness fitness specialist"
4. This will open up more room to expand upon "owner and health coach." Try a few bullets that answer "what do I do that my potential customers find most valuable?" I took Matt’s constructive feedback and made more changes. I focused my resume towards prospective clients for my small business. I feel I learned a lot from this experience and my current resume fully resembles my strengths. You can currently get a 32 page free .pdf sample of the book through The Resume Design Book Website and while you're there, watch 4 helpful video tutorials. Also, to celebrate the new release of the 2nd Edition, Matthew is giving away 10 copies! Check out the News & Blog section of his website for details on how to enter. I should really get this book for my children who are recent college graduates. They need all the help they can get with getting jobs and this book at least will help with the resume. I could have used this when I was younger for sure! This sounds like a great book. So many places have online applications now but I have always felt there is noothing better than a well thought out and decent resume. This would be useful for so many people. Resume writing is never fun. Having some easy to read pointers would be great! Resume writing is not my favorite thing. This book made it much easier. That's great you do it regularly. How awesome, what a great service. A few years ago I had to write a resume and I was sadly unprepared, things have changed so much since I last needed one! I had to spend hours and days researching what I needed and how to best portray myself. I certainly could have used this book. Pinning! It almost used to work in most of the cases. 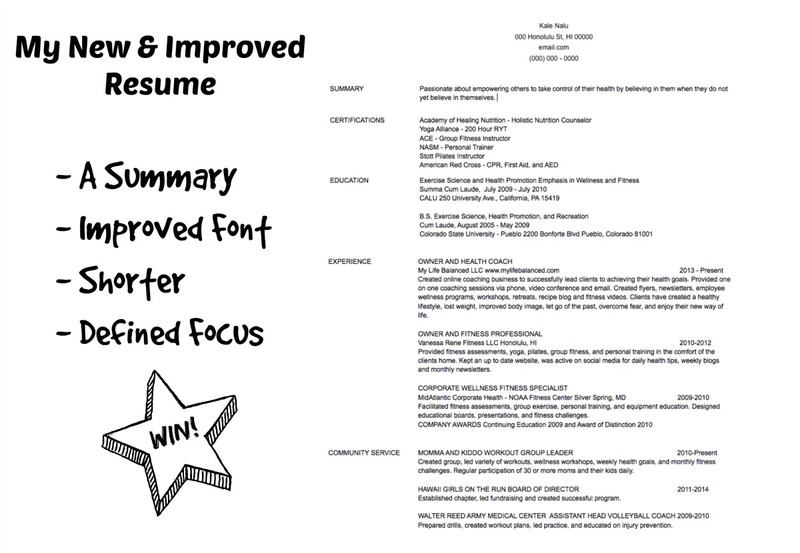 Your designee to good and also this book resume has positive info thanks for share it resume templates for 2017 .